Image: Marvel Comics. Legacy Banner art by Joe Quesada. The Marvel universe is facing some major changes again in the wake of Secret Empire. 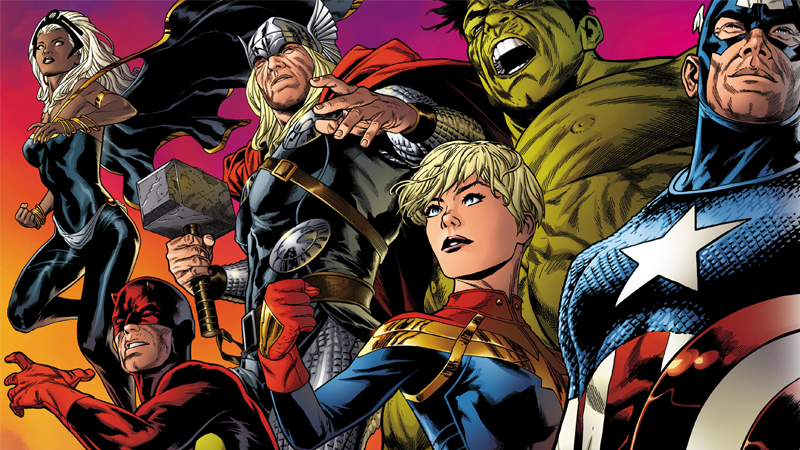 Starting this fall, Marvel is launching a line-wide shake up in the form of Marvel Legacy— something that promises to bring back fallen heroes and bring them into the fold with newer-established characters to create a mix of familiar and new. Just announced at C2E2, Legacy will kick off a line-wide reshuffling of Marvel’s comics. Kicking off with a 50-page one-shot special Marvel Legacy #1 by Jason Aaron (Mighty Thor) and Esad Ribic (Secret Wars, Thor: God of Thunder) that will set the stage for what’s to come in Marvel’s future, as well as establish a new status quo of “hope, heroism, heart,” according to a provided press release. That status quo will also involve the return of a “beloved Marvel mainstay,” who could be any number of candidates right now, from Tony Stark (who’s in a coma), to Bruce Banner, (who’s dead), to Captain America (who’s... well, it’s complicated), to even perhaps the Fantastic Four (who are off fixing the Marvel multiverse, as you do). After Legacy #1, the company will relaunch its current roster of comic books, with new series as well as the return of current and classic series, restored to their original issue numberings. It’s not the only esoteric element of days gone by that Marvel will bring back under the Legacy banner: Fan favorite holdovers like classic corner art on front covers, sales initiatives like the old Marvel Value stamps, and even the fan-focused magazine FOOM will be making returns alongside the wave of Legacy branded comics. Legacy represents a turning point for Marvel, as it pushes and pulls over ongoing controversies related to the diversification of its superhero lineup. Over the past few years Marvel has introduced new characters in legacy mantles, from Sam Wilson as Captain America and Jane Foster as Thor, to Carol Danvers, Kamala Khan, and many more heroes taking their first steps the spotlight. Those characters have caused consternation amongst traditionalists who want to see classic incarnations of these characters restored, which Legacy seemingly appears to be playing towards, as does the upcoming Generations series planning to bring classic incarnations of major characters together with their new counterparts. But it also seems like it will attempt to balance the mix of returning legacy heroes and the newer generations that have succeeded them—the aforementioned press release puts characters like Ms. Marvel, the Unbeatable Squirrel Girl, and America Chavez right alongside classics like Captain America, the Odinson (intriguingly not describes as Thor despite Quesada’s art depicting him with Mjolnir, perhaps indicating that Jane Foster will continue with that title at least), and Iron Man as being important characters playing a role in Legacy. It seems like the upcoming Generations series could set the stage for the most important status quos of Marvel going forward with Legacy, creating a mix of the newer characters fans have come to know and love in recent years, with iconic versions of some of Marvel’s most famous characters. Regardless of however it ultimately plays out, some big changes are coming to Marvel Comics later this year. More details on creative teams and comics coming as part of Marvel Legacy are expected to be revealed in the coming months.